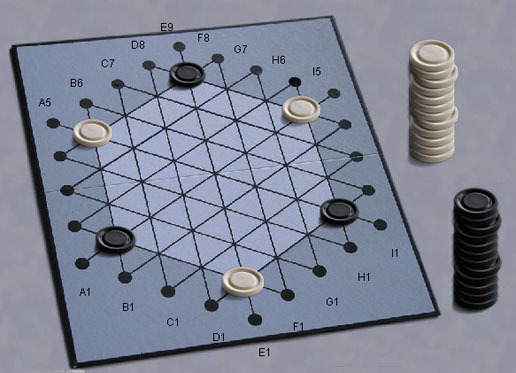 Gipf is the first game of the series, and also the "hub" that ties all the games together through the use of additional pieces. Boardspace implements all three official variants - the basic game without gipf pieces, the standard game with gipf pieces, and the tournament game. Gipf is superficially a simple variation of 4-in-a-row, where the rows are created by sliding pieces toward the center. But superficial is the key word, because it's a very deep brain burner of a game. Read the official rules on the project Gipf web site. Robots: Strong players haven't reported yet, but the bot is good enough to be a challenge to beginners. The back story: Gipf was the first of the project Gipf series, but the last of the games to be added to Boardspace. How odd is that? It's certainly the game in the series I understand the least, but having the other 5, I had to complete the set.